Four years at Hopkins can be as transformative personally as they are academically. From labs to libraries to study abroad, groundbreaking research happens everywhere, and can start as early as freshman year. Plan a visit to get a feel for life here, and stay connected with Blue Jay Families. What they do: International students, scholars, faculty, researchers, and staff can turn here for assistance with immigration and visas; housing, transportation, health care and other personal matters; taxes and other legal issues; and more. Walk-in appointments are available for general questions on F-1 and J-1 visas. What they do: If your student is at JHU, you’re a Blue Jay, too. Stay informed about university events, student support services, and family resources. 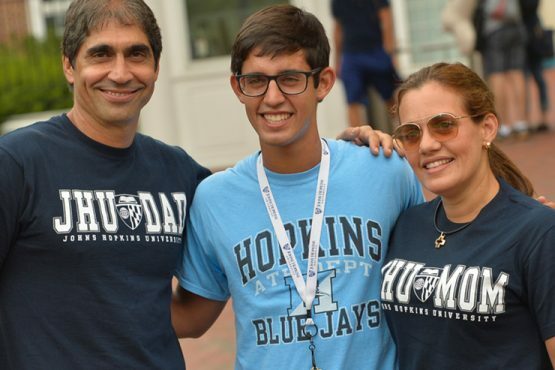 Get involved by becoming a Blue Jay Family Ambassador or join the Hopkins Parents Council. Support student life at JHU with a gift to the Hopkins Parents Fund. Plan a visit to explore campus and the surrounding community.